This blog is courtesy Russ Thornton of Wealthcare for Women. For those not familiar, there’s a corner of the internet for which FIRE is an acronym. There’s a thriving community around this idea of FIRE which you can find on Reddit here. While most of my clients are in their 50s and 60s, many (not all) of them eagerly look forward to their retirement. But here’s the thing . . . are you looking forward to retiring “from” something or retiring “to” something? In other words, is your job a grind and you’re literally just going through the motions until you have accumulated enough savings or pension credits so you can escape the rat race? Or do you have big plans for retirement? Many of my clients plan to travel more in retirement. Or spend a lot more time with their children and grandchildren. Or get more involved in their church or community. Or volunteer. Or learn. Or work in a part-time role that provides some degree of fun or fulfillment. Or, a seldom discussed third option is to find work you love, where you can make some kind of impact in the lives of a few or the lives of many while also earning some level of income. Now please don’t confuse this concept with the “follow your passion” advice that is often thrown about. It’s typically the shortest path to starving artist status. Sure there are those who fall into their dream career right out of college or grad school. But these are the exception and not the rule. And I’m not discounting the hard work that many of you have put in over a decades-long career. But maybe once you have achieved some degree of financial security and comfort, maybe even financial independence, it creates an opportunity to explore what’s possible. Let’s say you’re 58 years old and have been working in a corporate position and are currently earning $180,000 a year. Perhaps your plan is to work until 60 or 62 or 65 and just grind it out until you limp across the career finish line. But what about retiring in the next 12 to 18 months and finding work, or creating your own career or company, and working full- or part-time for the next 10 to 15 years? I get it. Maybe you’re tired and just want to relax. No more meetings. No more company bureaucracy. But how long do you need or want to relax? A few weeks? A few months? If you explore the Reddit link above, you’ll see some folks honest enough to share their own experience that once they’ve achieved their FIRE goal that they’re not sure it’s the goal they really wanted. Now what? I’m mid 30s, very frugal, unmarried, no kids, virtually no hobbies, high salary, low expenses, work in finance/tech, and can [retire] whenever.… I thought when I got to this point I’d be happier, more relaxed, but it’s yet to happen. Reading the Ramit Sethi article and seeing the quote above is what prompted me to write the article you’re reading. Many of my clients are very happy and living their lives on their terms, whether they’re still working or retired. And whether you’re in your 20s or 30s or in your 40s, 50s, or 60s, be sure that the goal you’re working toward, whether early retirement or something else, is truly the goal you want to achieve. In fact, I suggest you go through some exercises and imagine what your typical day will be like once you retire or reach a net worth of $3 million or whatever your goal is. What time will you get out of bed? Who will you spend time with? How often will you travel? Will you work at all? 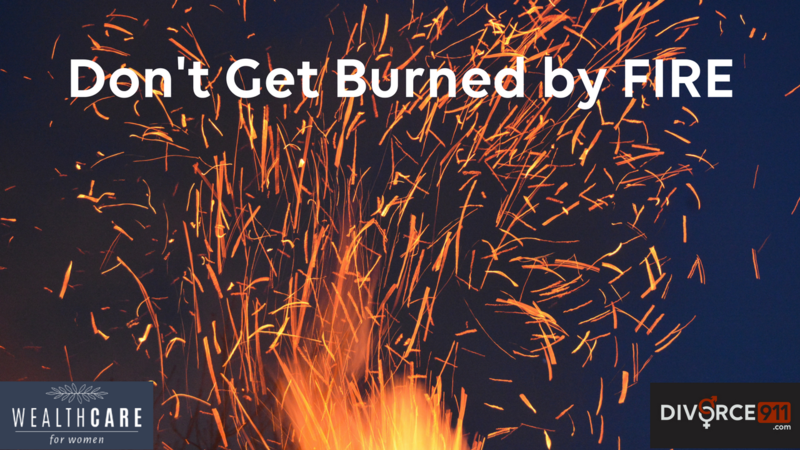 I’ve found this to be a helpful and revealing exercise, and perhaps it can help you make sure you’re pursuing the right goal for you and prevent you from being burned by FIRE. ©2017 Divorce911.com. All Rights Reserved |This information is deemed to be accurate. Reader / User is required to perform their own due diligence with the appropriate professionals. DIVORCE 911 is not a law firm, financial institution or advisor, registered mental health resource, does not practice law, and does not offer legal, financial, or therapeutic advice. ©2018 Divorce911.com. All Rights Reserved |This information is deemed to be accurate. Reader / User is required to perform their own due diligence with the appropriate professionals. DIVORCE 911 is not a law firm, financial institution or advisor, registered mental health resource, does not practice law, and does not offer legal, financial, or therapeutic advice. Thank you for contacting Divorce911. You request has been sent.